Can you believe it is May and almost Mother's Day? I think every day should be Mother's Day! Think of all the people in your life who have mothered you, they are all special people and deserve a little appreciation. Let's see what the Design Team has for us to show our gratitude. Marsha used this sweet image for a Mother's Day card. She used Buff Ivory as the main background over the green cardbase. After cutting out a pennant banner from designer paper and gluing it to the Buff Ivory, she added a piece of green twine from the Dark Jewel Hemp Cord collection. Those letters on the right side of the card are stickers from the Hodge Podge Magpie Stickers. How fun is that? For more details about her card, visit her blog Grammas Room. This week at The Kraft Journal we are celebrating MOMS, and Karen Letchworth is always happy to make a card for her dear Mom and/or Mother-in-Law because, as we all know, our Moms have done so much for us. Karen created her card using a Small Lunch Bag Kraft Note Card. She attached a "wooden" background patterned paper with some coordinating accessories and stickers. To that, she added a Lunch Bag Kraft Card Sleeve Envelope which is the perfect size for a gift card, and matches the Lunch Bag Kraft Note Cards perfectly. She tied some Black Baker's Twine around the Lunch Bag Kraft Card Sleeve Envelope and tucked a Small Grungy Prim Shipping Tag inside it for journaling purposes. Karen also attached a small piece of Black With White Polka Dot Washi Tape to the side of the card. Karen invites you all to stop by her blog, My Cup Runneth Over, to say hello; and she really hopes you will play along in this week's challenge! 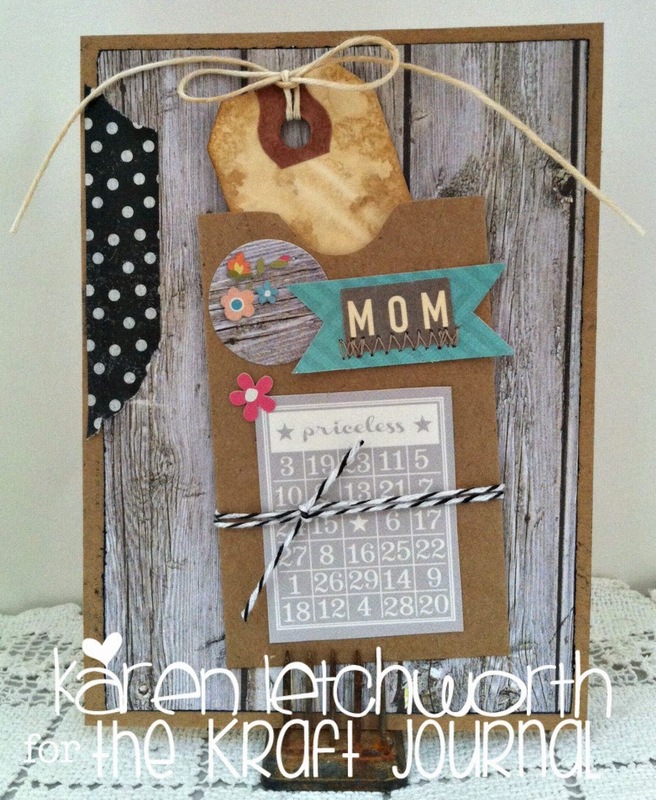 This week Tammy created a card a little on the shabby side for our Mother's Day challenge. She started with a card base of Brown Kraft Cardstock onto which she layered a pretty piece of patterned paper. Next she added part of a doily in the center adding a length of Natural Burlap Ribbon on top. Using Buff Ivory Cardstock, Tammy created a pennant for the center next layering on top with another pennant from patterned paper. She created a fussy bow from Aqua Mist Seam Binding which she embellished with a gold button and Natural Hemp Cord to complete the card. For additional pictures and product information please visit Tammy's blog: Creating Somewhere Under the Sun. I love the inspirational projects by the DT members!